Celtic boss Brendan Rodgers insists he could spot new St Mirren manager Oran Kearney’s ambition after just one phone call. The Northern Irish pair have never met face to face but did talk briefly when Kearney rang up his countrymen looking for advice after throwing his name into the hat for the Buddies job earlier this summer. The former Coleraine boss missed out that time as the Paisley post was handed to Alan Stubbs. But the drive which Rodgers identified during their short telephone conversation has now landed Kearney his opportunity after former Hoops defender Stubbs’ sorry Saints stint was called to a halt after just nine games. Celtic will provide the opposition for Kearney’s first match in charge and Rodgers says he will wish his new rival all the best - but only after Friday’s fixture is completed. “I’m obviously very disappointed for Alan and how quickly in the season he’s lost his job,” the Parkhead boss told the Celtic View. “He’s an excellent coach and manager but he’s now gone and Oran Kearney has come in. “He’ll no doubt look to come in and work closely with the squad to get a bit of momentum going. “We expect a tough game and we will prepare for that so I’m looking forward to going to the stadium and playing the game. “I’ve never met Oran but I’ve been aware of his work back home in Ireland. “I think when he first went for the job in the summer through a mutual friend of ours he wanted a chance to speak and we talked briefly for the first time. Celtic remain on a high after dominating Steven Gerrard’s Rangers in the opening Old Firm clash of the season just before the international break. And now as he prepares for his first trip to Renfrewshire as Hoops manager, Rodgers wants to see his team build on that victory. 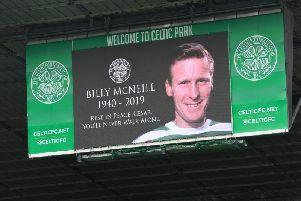 “I grew up with Celtic playing games at Love Street when the two sides met and it was always a renowned Scottish ground,” he said. “They have a different stadium now so it will be interesting to play in that for the first time. “I normally use a few days of the international break to reflect on the previous round of games. It’s been nearly three months so it’s been such a busy period. “I like to have thinking time to go away and take stock of everything that’s gone on.